Would you like a magnifier that brings you optimal reading comfort and sharp, magnified characters? Are you searching for a device with excellent image to read your letters in high contrast or see every detail of images? The ergonomic ClearView+ offers all of this and more. For a perfect reading comfort, the ClearView+ allows you to adjust the monitor to your preferred position with ease. Move the screen up or down, forward of backward or tilt it in order to optimize the distance between your eyes and the image. 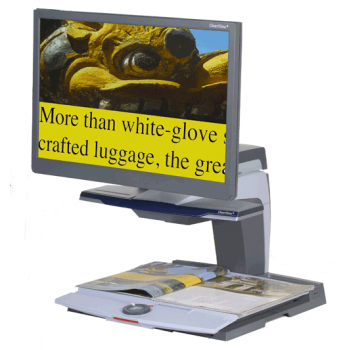 The optional ultra flexible monitor arm offers 90° degrees rotation for column reading. Benefit from many years of experience in the development of video magnification and see the sharpest details of characters or objects in high contrast. All ClearView+ units use the latest video processing technology, resulting in smooth character edges, vivid colours and true colour representation.